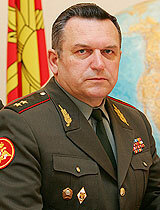 Firstly, following General Staff Chief Makarov, Bogdanovskiy said contractees will be reduced and conscripts increased. The LenVO needs 25,000 draftees from this spring’s consription campaign beginning on 1 April. But he said this won’t create problems because, last fall, 100,000 young men came through the LenVO’s voyenkomaty and 25,000 were deemed fit to serve. The LenVO Commander said, in the process of ongoing personnel cuts, 1,600 officers and 1,200 warrants have been ‘placed at the disposition’ of their commanding officers, but only 346 and 284 respectively have been discharged from the service. These are surprisingly small numbers. So, in the LenVO at least, only 22 percent of the officers destined for dismissal could actually be dismissed with the benefits and apartments owed them. The other 78 percent remain in limbo, without duty posts and living on their rank pay [perhaps one-fourth of their former total monthly pay]. And 24 percent of warrants could be sent home with benefits and housing while the other 76 percent wait for these things. Bogdanovskiy has also asked St. Petersburg’s governor to resolve a situation with owners of garages located on land the Defense Ministry claims near the village of Yukki, where the LenVO now wants to build apartments for servicemen. But that one will be hard; the Defense Ministry’s old nemesis Rosimushchestvo says the property doesn’t belong to the military. The builder and construction equipment have already been out to the site with the intention of knocking down the garages. Boganovskiy says the plan is to put 50 apartment houses on this territory. He indicated the problems started small, but failure to fix them in a timely manner means ten times the amount of money must be spent to repair them now. But he promised to do so by the end of spring. On the force structure front, he says the LenVO’s reforms were largely completed in 2009. Ten brigades and other units were formed or reformed in the process [the district has 3 combined arms brigades–the 25th, 138th, and 200th]. Interesting insights into what the Serdyukov’s reforms have meant for one, albeit small and not particularly significant, district. But, if such a large percentage of officers are being left ‘at the disposal’ of their commanders, can one believe Serdyukov’s assertion that 65,000 officers were put out of the armed forces last year? Does this include a small number of dismissed and a much larger number of those left ‘at the disposal’ of commanders? On an issue closely tied to officer cuts, can one believe that the Defense Ministry really obtained 45,000 apartments last year if so many soon-to-be-ex-officers are ‘at the disposal’ awaiting them? It would seem that, if Serdyukov has failed, or been unable, to move as speedily on officer reductions as he wanted, the door might be left open for someone to reverse this policy, especially if a large number of potentially angry officers remains for a long time in the limbo of being neither in, nor out of, the army. This entry was posted in Conscription, Ground Troops, Law, Order, and Discipline, Manpower, Military Housing, Officer Corps, Serdyukov's Reforms and tagged Contract Service, LenVO, Military District, New Profile, Nikolay Bogdanovskiy. Bookmark the permalink. I seldom have much to add to your blog, just want to say that I feel that I’ve learnt an enormous amount from it and I hope you keep up the good work.